For the forthcoming scheduled transatlantic service, British Caledonian Airways will be using Boeing 707-320Cs such as G-AXRS County of Caithness. The one of three aircraft types that go to make up the British Caledonian fleet in 1972 are shown in the current livery. 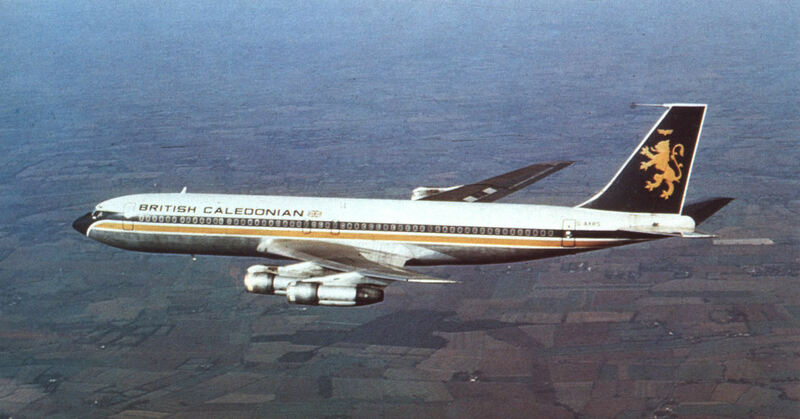 The Boeing 707 fleet has exclusively Caledonian origins. The venerable Douglas DC-3 played a vital part in the formative years of several of British Caledonian's predecessor companies, including Morton Air Services, whose G-AHCV shown here had previously been part of the BEA fleet. A Douglas DC-3, G-ANEG, in the markings of Transair. Following the Hunting-Clan Airwork merger, the BUA fleet went through a number of livery changes. In this picture a former Air Charter C-54, G-AOFW Jason, is seen in British United Airways colours with a Channel Air Bridge Carvair beyond. The Bristol Freighters of Silver City, such as this Mk 32 G-AMWC City of Durham were later absorbed into the BUA fleet and then separated out to be used by the British Air Ferries division, which was not involved in the Caledonian take-over. One of the four BUA VC 10s in pre-merger colours, with the name and flag of BUA's subsidiary Sierra Leone Airways also incorporated in the livery. 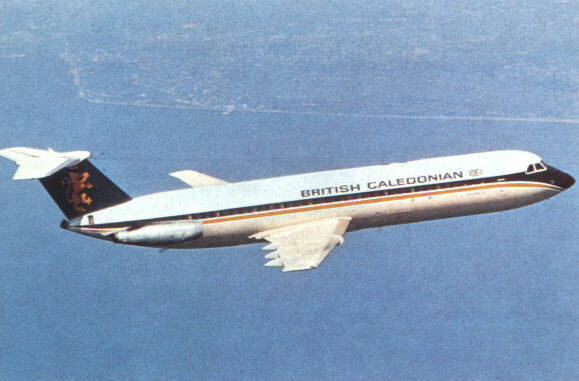 The one of three aircraft types that go to make up the British Caledonian fleet in 1972 are shown in the current livery. The four VC 10s were originally part of the BUA fleet and G-ATDJ was built initially for Ghana Airways before being acquired by BUA. One of the three Vickers Viscount 732s acquired by Hunting-Clan but used only briefly by that company in own colors. One of the Douglas DC-7s leased by Caledonian from Sabena, G-ASHL, and used primarily for long-distance charter flights, including many transatlantic journeys. The first aircraft operated by Caledonian Airways over the North Atlantic were DC-7Cs leased from Sabena, such as G-ASHL (originally OO-SFK). The BAC One-Eleven 500 G-AWYS Isle of Bute in the interim Caledonian//BUA markings used immediately after the take-over. The one of three aircraft types that go to make up the British Caledonian fleet in 1972 are shown in the current livery. BAC One-Eleven in the British Caledonian fleet include examples originally purchased both by BUA and by Caledonian Airways. Like the Bristol Freighter, the Aviation Traders Carvairs such as G-ARSD Chelsea Bridge, were used in BUA livery for a time before going to British Air Ferries. Morton Air Services, eventually acquired by BUA, operated de Havilland Herons such as G-AOGO on short routes from the UK. After acquiring Jersey Airways, BUA added its own livery to the fleet of HP Herald 200s, before transferring them to the separate division known as British United Island Airways. 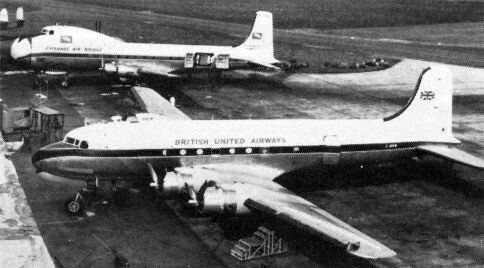 Air Charter Ltd, eventually to merge with Airwork, was the largest single user of the ill-fated Avro Tudor airliner; modified to have freight loading doors in the rear fuselage, it was renamed the Super Trader. After being retired by BOAC, a number of Handley Page H.P.81 Hermes 4s, such as G-ALDG shown here, were acquired by airwork and used primarily for trooping flights. Viking IB G-AIXR was one of the later additions to the fleet of Airwork, which acquired some earlier Viking Is for its first post-war airline operations.